With the advent of healthcare reform, new models of healthcare delivery are evolving. Emerging as one of the fastest growing and most promising is the patient-centered medical home (PCMH). Researchers have found that diabetes can be successfully managed within a PCMH environment. They say this model can improve outcome measures that enable patients to live longer, healthier lives.1 Historically, diabetes care has revolved around a patient-centered approach, self-management, patient empowerment, and team-based care1—concepts that match the PCMH model. The difference is that the PCMH focuses more on the coordination of care among various healthcare practitioners who share patient information with one another. Experts agree that diabetes care provides an excellent example of how the PCMH model works in practical terms, as it’s designed to improve processes and reduce overall healthcare costs. This article will discuss the PCMH, how it can improve diabetes management and primary healthcare in general, the important role RDs can play in this model of care, and the necessary skills dietitians need to successfully compete in this ever-changing healthcare environment. In this model, patients have 24-hour access to their healthcare providers, are able to schedule same-day appointments online, have access to their care providers between visits, and are no longer responsible for coordinating their care and calling for referrals and lab results. Instead, their physician leads a team of individuals who collectively take responsibility for the patient’s care. With the advent of reforms, such care will no longer be the exception but the rule. The PCMH and other new models of healthcare delivery improve clinical outcomes, patient and team-member satisfaction and, ultimately, reduce the cost of healthcare. And RDs will be key members of the team, working as case managers, training staff on self-management support, and coordinating shared medical visits. A well-prepared dietitian will be in a position to play a vital role in this care-delivery model. • Quality and safety are assured. A care planning process informs healthcare decisions based on scientific evidence; performance measures are implemented; patients participate in decision making; information technology is used to support patient care; and practices undergo a voluntary recognition process by a nongovernmental entity. • Payment is in alignment with the added value of having a PCMH. The growing trend toward a PCMH is, at least in part, in response to a crisis in primary care: There are fewer available primary care providers as a result of fewer physicians choosing careers as general practitioners.9 Many primary care physicians feel overworked and undercompensated. The hours are long; the paperwork is burdensome; and doctors have a large patient load. In an April 2011 study published in Diabetes Care, researchers collected information on eight PCMH pilot programs from around the country that reported process and outcome measures in diabetes care. They found that the healthcare delivery model improved hemoglobin A1c measures, blood pressure, and LDL cholesterol levels—the key predictors of mortality and morbidity associated with diabetes—and reduced inpatient and emergency department admissions.1 The eight PCMH initiatives took place in large healthcare facilities in several states, including North Carolina and Pennsylvania, and involved more than 1,200 medical practices, 4,000 physicians, and 10,000 patients (see Table 1 below). Currently, more than 40 medical home demonstrations that track quality measures in diabetes are under way nationally. And while no randomized trials have been conducted on the effectiveness of the PCMH in diabetes management, “the eight Medical Home initiatives reported provide encouraging ‘before and after’ results to support the PCMH as a viable mechanism to improve the quality and costs of diabetes care,” the study authors wrote. Where Is the PCMH Used? Another challenge to the PCMH specific to diabetes care is the availability of diabetes educators. Sandra Burke, PhD, ANP, BC-ADM, CDE, FAADE, president of the American Association of Diabetes Educators (AADE), says there’s a limited number of qualified diabetes educators in the country, particularly in areas where the disease is prevalent such as in the “diabetes belt,” a swath across the southeastern United States where people are more likely to have the disease. Moreover, Teresa L. Pearson, MS, RN, CDE, FAADE, director of clinical consulting at Halleland Habicht Consulting, LLC in Minneapolis, says there may be a “little bit of turf protection” as practices transition to team-based care. Care providers at all levels and disciplines are accustomed to doing their work autonomously. Having to share information, communicate about coordinated care, and allow access to information that formerly might have been proprietary can be an initial challenge. However, in every case Pearson has observed, team members agree “they would never go back to the way it was” before becoming a PCMH. Shared medical appointments (SMAs), which are often part of the PCMH model, are an effective way to provide care and education. In an SMA, also known as a group visit, multiple patients are seen as a group for follow-up or routine care. A study published in 2012 in the Journal of the American Academy of Nurse Practitioners observed 37 patients with diabetes and hypertension who participated in SMAs for four months. At the end of the study period, researchers measured changes in patients’ self-managing behaviors, including exercise and goal-setting activity. On average, systolic blood pressure was reduced 30 mm Hg; A1c was reduced 0.25%; and LDL cholesterol was lowered by 4 mg/dL. Their average exercise time increased by 86 minutes per week. Ninety-seven percent of participants reported achieving or almost achieving measurable self-care goals. And 95% of participants rated the group visits as excellent or very good. This study indicates that SMAs are effective in changing the outcomes for patients with chronic conditions such as diabetes and hypertension. “RDs may need more specialized credentials,” says Sylvia A. Escott-Stump, MA, RD, LDN, past president of the Academy. She says RDs can’t just be generalists if they’re to remain competitive in the changing healthcare environment. They must also make strategic use of the skills they already use in their own practices. “RDs have strong management and business operation skills and could work as case managers in the PCMH,” Escott-Stump says. A prime example is Cecilia Sauter, MS, RD, CDE, project manager at the University of Michigan Health System in Ann Arbor. She’s responsible for implementing the PCMH in 18 centers and is the self-management trainer for all the allied healthcare providers in the system. It may seem an unusual role for a dietitian and diabetes educator, but “dietitians need to think out of the box,” Sauter says. The MA starts a conversation with the patient about self-management goals. “They will ask the patient, ‘How did it go with the last goal? I see you were going to walk once a week,’” Sauter says. Then the MA gives the completed medication list to the physician who addresses the patient’s larger concerns. “Everything is completed when [the doctor] sees the patient. If there were gaps in care, that would be taken care of [before the doctor got involved],” Sauter adds. Next, the doctor determines whether patient education is required. A nurse is available to start the patient on insulin if needed. The doctor writes referrals to the dietitian for medical nutrition therapy, which is provided in the clinic and can be coordinated based on the patient’s availability. The way a diabetes care team works can overlap effectively with the PCMH model. Diabetes educators work with other team members to provide evidence-based, patient-centered care. They facilitate patients’ effective self-management of diabetes and encourage them to adhere to recommended behavior changes. It’s also the AADE’s position that all diabetes educators should work toward receiving formal certification, which can help them become more respected, sought-after members of the PCMH team. “The diabetes educators’ role in the PCMH will depend on their skill level,” Burke says. The AADE’s 2009 practice guidelines delineate the roles and responsibilities of five levels of diabetes education providers as follows: Level 1, non-healthcare professional; Level 2, healthcare professional non-diabetes educator; Level 3, non-credentialed diabetes educator; Level 4, credentialed diabetes educator; and Level 5, advanced level diabetes educator/clinical manager (see Table 2 below). RDs who aren’t credentialed as diabetes educators are categorized as level 3 educators. They may provide instruction for insulin injection, dosing, and medication side effects in addition to nutrition counseling. Level 4 educators are RDs who are credentialed as CDEs—those who’ve met the academic, professional, and experiential requirements of the National Certification Board for Diabetes Educators. They may perform clinical assessments, including relevant lab values, food/drug interactions, diabetes-specific medication use, and psychosocial adjustment. Someone who’s credentialed as both an RD and CDE can make medical nutrition therapy-related diagnoses as well. Level 5 educators are advanced-level educators and clinical managers who are board certified in advanced diabetes management (BC-ADM). These RDs engage in autonomous assessment, problem identification, planning, implementation, and evaluation of diabetes care. They may function with protocols, depending on the facility and organization policies, bylaws, and clinical privileging; state practice acts; and state occupation supervision regulations. Passage of the Patient Protection and Affordable Care Act put the United States on the path of a new healthcare paradigm that may have a tremendous impact on the supply of and demand for dietetics practitioners. It promises to change the way healthcare is delivered.12 Encouraging results from PCMH pilot demonstrations make it clear that this model will remain a factor in the way healthcare is provided. If RDs are going to remain competitive, it’s important for them to understand the PCMH model and how they fit into it. The epidemic of diabetes persists—its prevalence doubled between 1986 and 2006—and costs the government billions of dollars a year. Research supports the hypothesis that diabetes can be prevented, and the Patient Protection and Affordable Care Act emphasizes preventive care for diabetes.13 Historically, nurses and dietitians have offered diabetes education. However the role of the diabetes educator has expanded to providers in other disciplines as well as lay health workers.14 To compete in this environment, RDs may benefit from specialization as a CDE and BC-ADM, certifications that will enable them to be a greater asset to the healthcare team. As part of the PCMH, RDs holding these credentials will be uniquely qualified to supervise those in the lower levels of competencies, assist patients in developing self-management plans, train PCMH teams on self-management support, coordinate SMAs, and work as case managers. RDs will be on the frontlines of diabetes management. 1. Bojadzievski T, Gabbay RA. 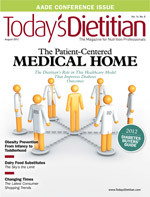 Patient-centered medical home and diabetes. Diabetes Care. 2011;34(4):1047-1053. 2. Diabetes public health resource. Centers for Disease Control and Prevention website. http://www.cdc.gov/diabetes/consumer/research.htm. Updated February 16, 2012. Accessed May 15, 2012. 3. Lipscomb R. Understanding the patient-centered medical home. J Am Diet Assoc. 2009;109(9):1507-1508. 6. Martin JC, Avant RF, Bowman MA, et al. The Future of Family Medicine: a collaborative project of the family medicine community. Ann Fam Med. 2004;2(Suppl1):s3-s32. 7. Robert Graham Center. The Patient Centered Medical Home: History, Seven Core Features, Evidence and Transformational Change. http://www.graham-center.org/online/graham/home/publications/monographs-books/2007/rgcmo-medical-home.html. Accessed May 11, 2012. 8. Joint principles of the patient-centered medical home. Patient-Centered Primary Care Collaborative website. http://www.pcpcc.net/content/joint-principles-patient-centered-medical-home. Accessed May 11, 2012. 9. National Committee for Quality Assurance. Standards and Guidelines for Physician Practice Connections — Patient-Centered Medical Home (PPC-PCMH). http://www.ncqa.org/LinkClick.aspx?fileticket=3vQKgtlkp7g=&tabid=631&mid=2435. 2008. Accessed May 15, 2012. 10. Berenson RA, Hammons T, Gans DN, et al. A house is not a home: keeping patients at the center of practice redesign. Health Aff (Millwood). 2008;27(5):1219-1230. 11. AADE Practice Advisory: medical home and its importance for the diabetes educator. American Association of Diabetes Educators website. http://www.diabeteseducator.org/export/sites/aade/_resources/pdf/Medical_Home_Practice_Advisory.pdf. Accessed May 15, 2012. 12. Rhea M. Future changes driving dietetics workforce supply and demand: Future Scan 2012-2022. J Acad Nutr Diet. 2012;112(3 Suppl):S10-S24. 13. Tuma PA. An overview of the intentions of health care reform. J Acad Nutr Diet. 2012;112(3 Suppl):S56-S63. 14. American Association of Diabetes Educators. Guidelines for the Practice of Diabetes Education. http://www.diabeteseducator.org/export/sites/aade/_resources/pdf/PracticeGuidelines2009.pdf. 2009. Accessed May 15, 2012. Hemoglobin A1c, blood pressure, and cholesterol were above the National Committee for Quality Assurance (NCQA) target benchmarks. Reduction in emergency department and inpatient admissions and reduction in outpatient and pharmacy utilization. Improvements in the diabetic bundle (nine evidence-based quality indicators of diabetes care); reduction in inpatient admissions and total medical costs. A1c, blood pressure, and LDL cholesterol control improved in the first year. Improvements in A1c documentation, blood pressure control, and smoking advice documentation six months after beginning the initiative. Improvement in the composite quality score in the first and second year. Improved patient satisfaction, reduced emergency department and inpatient admissions; return of $1.50 for every dollar invested in the PCMH after 21 months. A1c, blood pressure, LDL cholesterol, aspirin use, and tobacco cessation improved. Reductions in inpatient admissions and readmission; clinic cost savings. A1c, LDL cholesterol, and blood pressure control; all measures above NCQA quality benchmarks, including tobacco cessation and depression screening. Reduced emergency department and inpatient admission; improved patient satisfaction; improved healthcare worker satisfaction. Improvements in chronic illness care quality. No improvements in patient experience; practice coaches helpful in adopting more medical home features. Assess basic diabetes management skills/knowledge of diabetes and literacy/numeracy; motivation and readiness to learn and make behavior changes; attitude toward learning and preferred learning style; and impact of social, economic, and cultural aspects/circumstances. Identify potential barriers to behavior change, including cognitive and physical limitations, literacy, lack of support systems, and negative cultural influences. Screen for acute and long-term complications. In addition to level 3 assessment, perform clinical assessment (including relevant lab values) and physical assessment (including signs of malnutrition and anthropometrics). Assess food/drug interactions, use of over-the-counter medications, diabetes-specific and diabetes-related medication use (eg, insulin-to-carb ratios), and psychosocial adjustment (including coping strategies and eating disorders). Make medical nutrition therapy diagnosis. Guide patient in setting individualized behavioral goals, prioritizing goals based on assessment and preference, and develop success metrics. Including level 3 criteria, guide patient in developing clinical goals to address needs identified in all areas of the assessment. Use behavior change methodology (motivational interviewing, cognitive therapy, etc) to ensure and influence patient participation in the education process. Develop basic plan related to acquiring necessary diabetes management skills based on needs identified in assessment. Develop educational plans to address behavioral goals established in the goal-setting process and a learning plan to address gaps in knowledge. Plan strategies for addressing barriers identified, and refer to prescriber as needed. Develop a detailed intervention plan to address both clinical and behavioral goals established in the goal-setting process and a learning plan to address gaps in knowledge. Plan strategies for addressing barriers identified. Follow protocols and/or refer to specialist as needed. Suggest/support diabetes management skills training; offer guidance on accessing care and financial issues (reimbursement). Refer to prescriber or CDE as needed. Recommend and execute plan; ensure patient has the knowledge, skills, and resources necessary to follow through on the plan. Identify and address barriers that become evident throughout the process. Reassess cognition of goals and plan, monitor adherence, and refer to prescriber or CDE as needed. In addition to criteria in level 3, reassess clinical and behavioral goal achievement at each visit, and reassess and revise plan and goals. Monitor adherence to plan. In addition to criteria in levels 3 and 4, follow protocols and refer to other specialists as appropriate.